In Tampa, Mother attends the Adult Day Care program provided by Pinellas County’s Neighborly Care Network three times per week. Since she has attended at three different locations over the past 4 years, we just call it “The Senior Center” rather than trying to remember a new name each time. She loves going, loves the activities, and I love seeing her look forward enough to it to take the initiative to set her alarm and get herself up and medsed and coffeed and cookied in time for their van to pick her up around 8:00 a.m. on the days she attends. At home, since she attends while I am at work, it is less a respite for me than it is an enrichment for her. If she were just left alone at home all day, she would do nothing but lie down on the couch, dozing and watching the Encore Westerns channel, until it was time to make her sandwich for lunch. After lunch – back to the couch. Even though the physical therapists told her that lying down all the time is what contributes to her poor muscle tone and poor balance, she will not sit up without me being on her all the time about it, and life is too short for either of us for me to have to be the couch/pillow police all the time. So, 3x per week at the Sr. Center is a definite help and enrichment for all of us. When she’s at home, she is on top of all of her ADLs (except bathing, and the bath lady comes every Tuesday) and since she watches the evening news, is generally more informed on local and national events than I am. When we got on the road for our Thanksgiving trip, however, all that structure and memory support was removed and it was like every day was a new day. She had a hard time realizing that while we were spending Thanksgiving Day at my niece’s home, we wouldn’t be there all week, and wouldn’t be sleeping there at all. She had a hard time remembering what day Thanksgiving was on. Every time it’s time to get back into the truck, she asks what side she’s supposed to get in on, even when Steve is standing beside the open door with the extra platform step set up beside it. She asked several times how long we would be staying in our hotel, and seemed surprised and amazed every single time she learned the answer was “six nights”. The day before we were planning a busy day running around, one that I knew would be challenging for her, Steve and I were reading in the hotel room (with the tv muted and closed-captioned for her) when she said to me, “Look at all this money!” I looked up to see that she had gotten Steve’s wallet off the desk, opened it up, taken out all the credit cards, and was then marveling at our travel cash. At that point, I realized our plans for the following day were really beyond what we could reasonably expect for her and I started looking for some kind of respite placement. 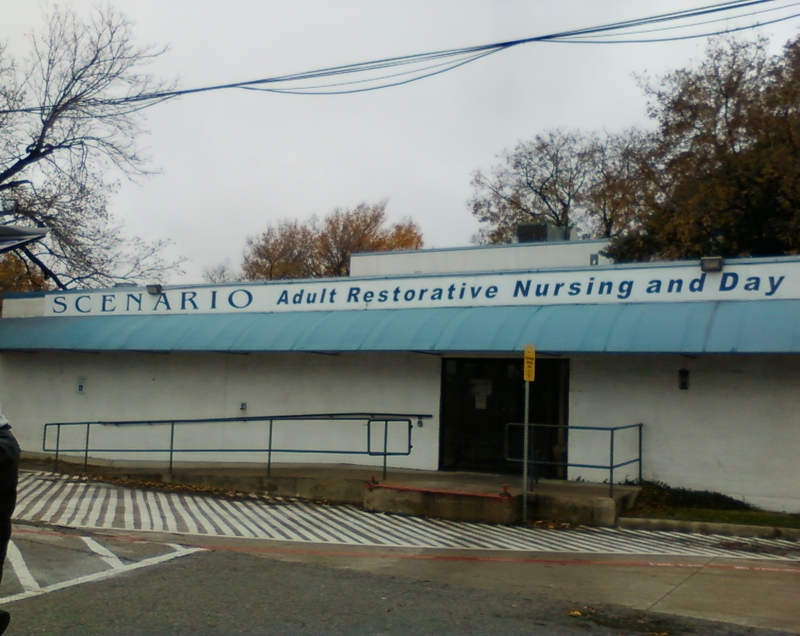 An internet search led me to the Scenario Adult Day Services near Bachman Lake in Dallas. I called and spoke initially to Ricky who was very helpful and encouraged us to come over that afternoon for a brief tour. We met with Miss Elizabeth (I forgot to get her card, so I don’t know her last name) who had us fill out some paperwork, had the nurse perform a brief health assessment, and helped us set up for a respite day for Tuesday. They have two buildings with separate programs, one for the elderly, where Mother attended, and the other for younger adults in need of daycare services. We were concerned Mom would object, but it has been pretty cold here this week, and when we said we would be doing a lot of walking around, and then referred to it as “The Dallas Senior Center”, she didn’t seem to have any objections. We dropped her off, and after running several errands and having lunch with a friend, we got back to the center in the middle of Bingo. She didn’t even notice we were there until that Bingo game was over. Later I asked her if she had enjoyed playing and she said yes, but she was disappointed they didn’t have any cookies for prizes. Oh, well. Thank you, Ricky and Elizabeth and Scenario, for providing Mother a safe, fun place for the day and a bit of respite for all of us in the middle of our 9-day Texas Thanksgiving Odyssey 2013. 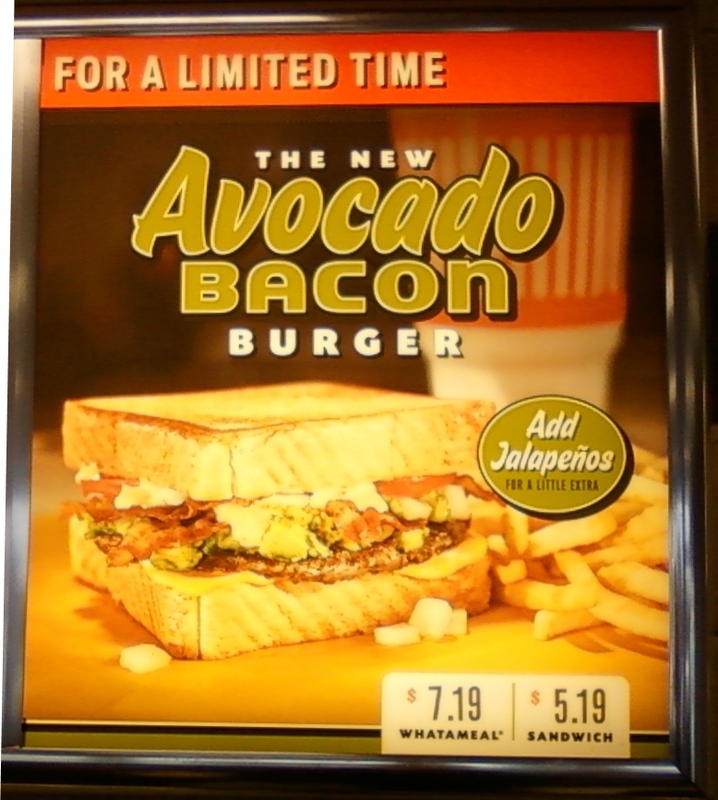 How nice to be back in Texas, even if only for a visit. 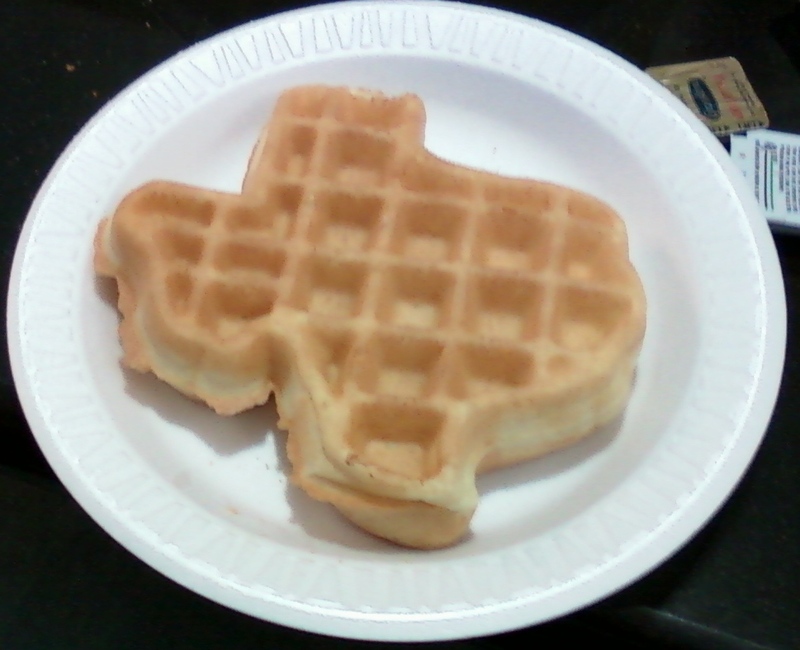 Even the food is welcoming me home. 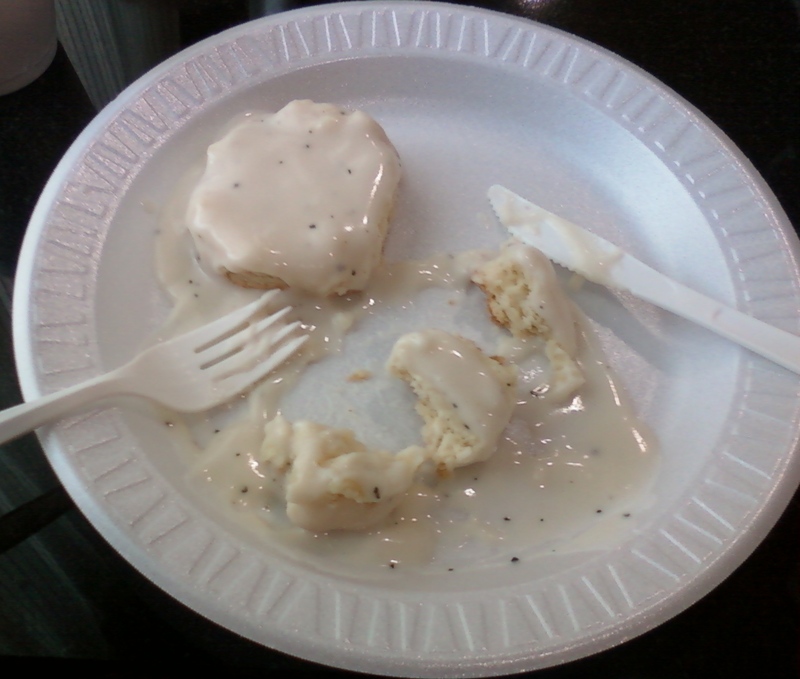 Biscuits with white cream gravy, also at the La Quinta breakfast bar. Very southern. Very yummy. 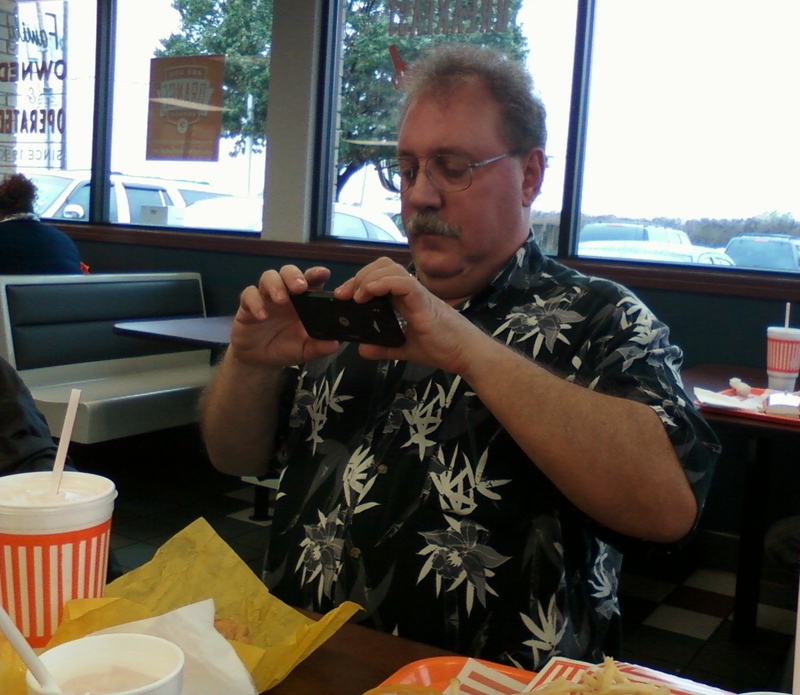 And what trip back to Texas would be complete without a stop in at Whataburger! 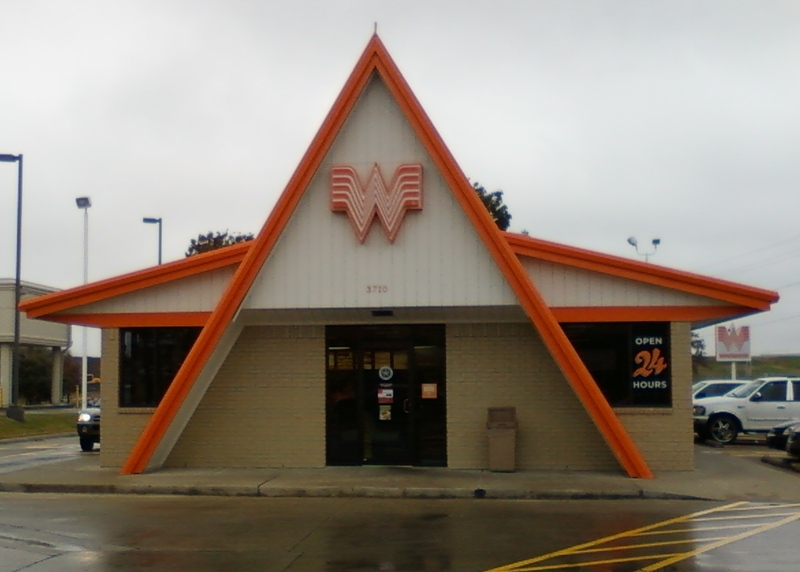 A Texas tradition since 1950! 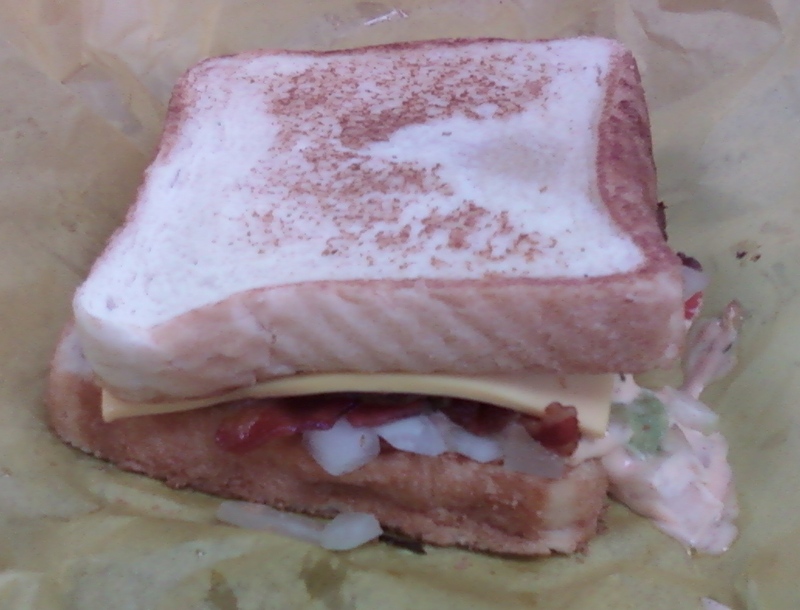 Well, okay, the actual sandwich is not quite as pretty as the one in the ad on the wall, but it was still pretty tasty. And look – all this food photographing behavior is contagious!